So, this is my 2nd post ever about banjos, even though they have been my primary hobby for the last 3 years. That’s restraint. If you like the banjo and want to learn a little history (very little), you might find this interesting. This, by the way, was the song that first got the banjo on Top-40 radio. Clawhammer style, where you strike the main strings with the back of the fingernail and pluck the 5th string with your thumb in a syncopated beat, has been around for hundreds of years. The 3-finger bluegrass style was more or less invented and popularized by Earl Scruggs. It was flashy and noisy (and new and exciting), so it caught on. The clawhammer style of playing actually dates back hundreds of years to Africa where 3- or 4-stringed instruments—always with a short drone string on top—were played in much the same fashion. This style of instrument and playing was brought over by African slaves, which explains the syncopation of the clawhammer playing style. Sometime around 1830, the 5-stringed banjo was developed by a minstrel performer named Joel Walker Sweeney. By the civil war, 5-string banjos were getting to be popular; in fact, Stephen Foster’s famous song Oh, Susanna with it’s line “with a banjo on my knee” was published in 1848. An interesting historical sidenote is that in the early days of slavery, both African and Irish slaves were often housed together, where African rhythms were added to Irish folk tunes, giving us Appalachian or “old-time” fiddle and banjo music. Many people assume that when Sweeny added the 5th string to create the modern banjo, this means he added the short 5th string. However, that is not the case. 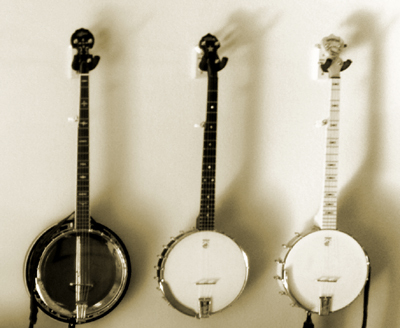 As stated above, the banjo and its predecessors always had one short string. The 4-string Tenor banjo that became popular in the 20’s was a later invention—first appearing around 1910—that was developed to be strummed with a pick. The resonator was also developed to add volume so the banjo could be heard on early orchestral recordings, as guitars were, as this was pre-amplification, not loud enough. By contrast (and for example), my oldest 5-string banjo is a Buckbee, dating back to around 1880-1890. (It is nearly identical to the banjo played by Taj Mahal in the movie Songcatcher.) The Buckbee Banjo Co. began manufacturing banjos during the Civil War and went out of business in 1896 or ’97. Okay, 2 more tunes. This is from the Honey Dewdrops, one of my favorite folk duos. Laura Wortman is a great example of a modern folk clawhammer banjoist. As my friends are all too aware, I’ve become something of a banjo addict since buying my first banjo not quite 3 years ago. I play (old-time or clawhammer style), restore and collect banjos, and listen to a whole lot of banjo music of different genres. (Yes, there are distinct genres of banjo music.) So far, I have avoided posting anything about banjos on this blog, but have finally decided that it’s probably time to include the occasional post related to banjos and banjo music. The more I listen to banjo music, the more opinionated I have become about the different banjo styles. While I have always thought I loved bluegrass music, I come to discover that I really don’t care for a lot of it, mainly due to the banjo playing. I recall something I once heard about the key to jazz music being knowing what notes not to play. With much of bluegrass, there is no such concept. To be honest, a lot of bluegrass banjo playing is just noise—too many notes unceremoniously crammed into too small of a space. When played with discretion, the banjo can add rhythm and drive, and even melody and counter-melody. The problem is, discretion seems to be in short supply with many bluegrass players. Another complaint I have with bluegrass banjo is that many times the focus is on speed and dexterity. While I appreciate the abilities of folks like Béla Fleck or Jonny Mizzone (who’s like 10 years old), to me, I might as well be listening to a machine. There are a lot of fast, perfect notes, but it seems too clinical much of the time. I do really like some bluegrass players. My favorite has to be Ron Block, who plays most often with Alison Krauss & Union Station. Block is a great player, and has a very good sense of melody and balance. I appreciate his playing whether he’s playing on a pop song or a traditional bluegrass number. I liked Earl Scruggs, who invented the style. I’ve also liked a number of other players, like Doug Dillard, John Hartford, and of course John McEuen (of Nitty Gritty Dirt Band fame). I’m also a big Steve Martin fan. I’ve discovered one of the things that drives me nuts about a lot of bluegrass players, and that is the overuse of the infamous “G lick.” It is probably the most recognizable lick in bluegrass banjo, as you’ll discover if you Google it. I’ve heard many bluegrass tunes where the G lick is used in nearly every phrase. It’s enough to drive you crazy, once you recognize it. It’s one of the first things banjo players learn, and it seems like often it’s the only thing they’ve learned. It belongs in “Foggy Mountain Breakdown,” but not in much else. Notice how the banjo approaches the song almost classically, with an awareness of each note being played (as well as each note not being played). This kind of playing is what first attracted me to the banjo, not that racket that appears on 90% of the bluegrass I hear. So, there’s good banjo, and then there’s bad banjo. I like good banjo.